Red-headed woodpecker with yellow bellied, hairy and downy woodpeckers. Hand colored engraving, after a drawing by Alexander Wilson. 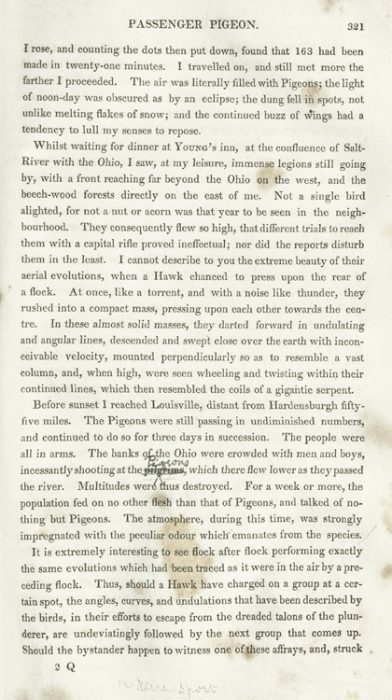 In: Alexander Wilson’s American Ornithology, or, The Natural History of the Birds of the United States, vol. 1 (Philadelphia, 1808). 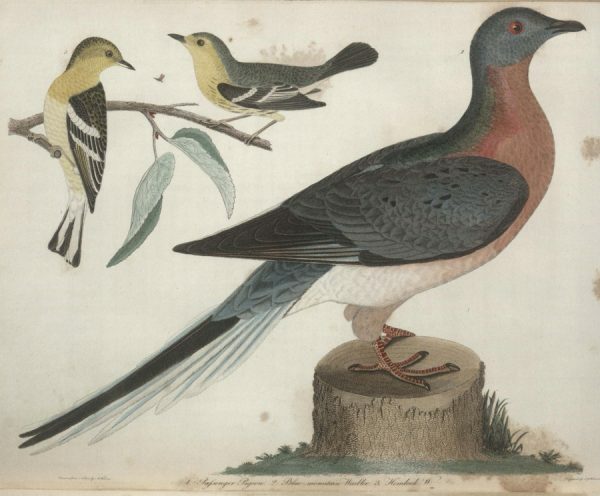 Alexander Wilson’s project to illustrate all the birds of North America preceded John James Audubon’s by a decade. Wilson’s work sought to bring his readers to "a contemplation of the grandeur, harmony and wonderful variety of nature" through engravings colored from nature and through "biographies: of birds that go well beyond mere description."" Wilson had no inkling that the birds he lovingly recorded might someday vanish. In the early 1800s Wilson called the red-headed woodpecker the most universally known bird in North America. From the 1940s to 2005, the populations of these birds had shrunk 66%, mainly from the loss of nesting cavities and food sources such as acorns and beechnuts. Dodo and its gizzard stone. Woodcut, after a drawing by Admiral Jacob Cornelius van Neck (first published in C. Clusius’s Exoticorum in 1605). In: Juan Eusebio Nieremberg’s Historia Naturae (Antwerp, 1635). The dodo, whose very name conjures up the concept of extinction, vanished by 1660 under intense pressure from hunting. Just as with the passenger pigeon in centuries to come, the dodo offered an easily obtainable source of food. The large flightless relative of the pigeon inhabited only the islands of Mauritius, leaving it vulnerable to the sailors who sought its flesh and eggs—and to the rats and dogs that the sailors introduced to the islands. This woodcut, made after a drawing from life, shows the soon-to-be doomed species with its gizzard stone. Carolina parakeet and smaller songbirds. 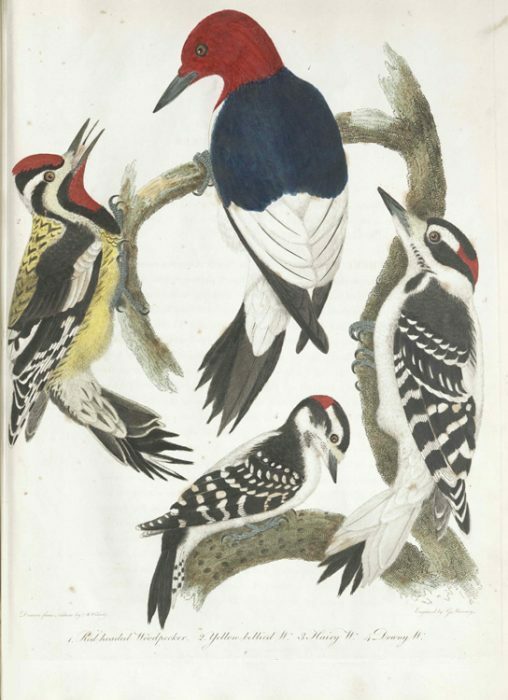 In: Alexander Wilson’s American Ornithology, or, The Natural History of the Birds of the United States, vol. 3 (Philadelphia, 1811). Wilson’s image of the now extinct Carolina parrot (now called the Carolina parakeet) captures the bird in an active pose. Once ubiquitous throughout the Southern states up through Ohio, the birds fed in large flocks on cockleburs and fruits. Wilson describes a flock screaming through the woods to settle at a salt lick, like a "carpet of the richest green, orange and yellow." The birds’ depredations on fruit trees brought them into conflict with farmers. Although this colorful, noisy, and gregarious species outlasted the passenger pigeon, hunting and habitat loss eventually extinguished it by the 1930s. Passenger pigeon and warblers. Hand colored engraving (reproduction), after a drawing by Alexander Wilson. From Alexander Wilson’s American Ornithology, vol. 5, reproduced in: Shepard Keith’s Spirits of the Air (Athens, Ga., 2009). 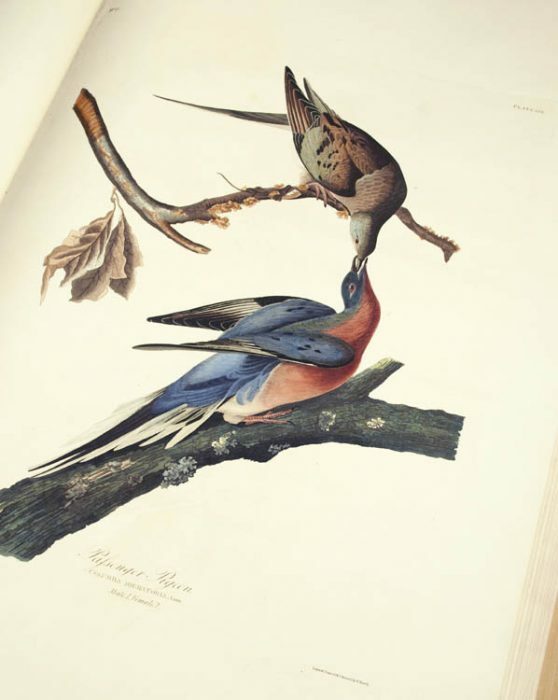 James Bowdoin III died in 1811 before Wilson’s American Ornithology had been completely published, so this later volume, which includes the print of the passenger pigeon, was never a part of his library. Wilson’s image of the wild pigeon, which he called “a very interesting species,” features the long-tailed bird gripping a stump with its claws. It gave rise to innumerable variations and copies over the next one hundred years. 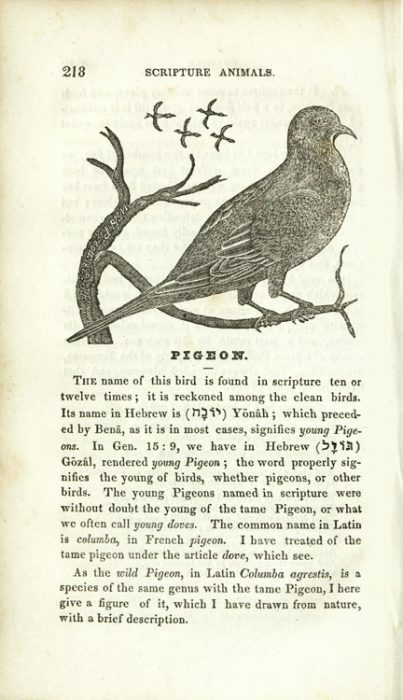 Wilson’s design appeared in later ornithology texts (Thomas Nuttall’s Manual of the Ornithology of the United States, 1832), children’s books (The Illustrated Alphabet of Birds, first published in 1851 by William Crosby and H.P. Nichols), and reminiscences, such as Samuel G. Goodrich’s from 1856, included in this exhibition. Male passenger pigeon, on the Ohio River in Kentucky. Drawing (reproduction) by John James Audubon, 1809. 6 x 9.5 inches. This modern print records Audubon’s earliest surviving drawing of a passenger pigeon, dated December 11, 1809. The original drawing is in the Houghton Library at Harvard University. No surviving image by Audubon attempts to capture the vision of millions of passenger pigeons that the artist described as blocking out the sun for three days. However, Audubon’s quietly perching adult male pigeon conveys the striking coloring of this species, which must have been even more stunning when multiplied by the hundreds of thousands. The slate blue-grey back and head contrast to the ruddy breast and brilliant red eye of this specimen. The sharp black beak, red feet, and long tail feathers distinguish it clearly from the mourning dove, a smaller species with more subdued coloring. Hand colored etching by R. Havell, after an original painting by John James Audubon. From John James Audubon’s The Birds of America, [Double elephant folio] vol. 1, (London, 1827), plate 62. The first edition of Audubon’s monumental work contains 435 plates depicting 1065 figures of 489 species of American birds, in life size, reproduced from Audubon’s paintings. Audubon drew largely from specimens gathered in the field or from skins sent to him by naturalists to create his representations. To reproduce his paintings, the images were copied by means of etching on copper plates (often with additional aquatinting and with occasional engraving) and printed in black ink on “double elephant folio” paper by Robert Havell of London (except for plates I - X, which were editioned by W. H. Lizars of Edinburgh). Once printed, the images were then hand colored with watercolor before being distributed, either in installments to subscribers (in eighty-seven parts of five prints each) or as complete bound copies to the general public. Approximately 175-200 full sets were published. Of these, 120 complete sets are thought to survive, perhaps seventy of which are located in North America. John James Audubon’s Ornithological Biography, or, An Account of the Habits of the Birds of the United States of America, vol. 1 (Edinburgh, 1831). 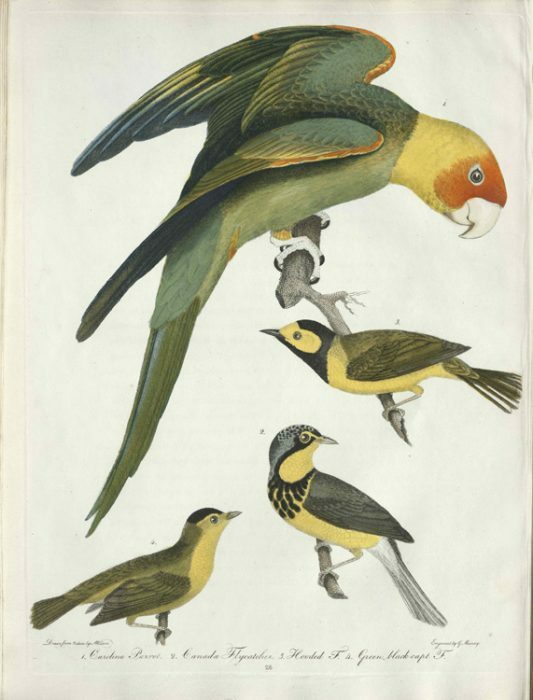 Audubon published separately the textual descriptions that reffered to his illustrations. This was done in order to circumvent copyright laws that might otherwise have applied to the double elephant folio edition. As sets of prints without text, rather than “books,” Audubon’s etchings became exempt from the requirement that copies of books printed in England be deposited in various British libraries. Audubon gives vivid early nineteenth-century accounts of the overwhelming spectacle of flocks of passenger pigeons darkening the sky for days. He compares the din of millions of wings and voices to the raging of a storm at sea or the roaring of Niagara Falls. The copy displayed here, formerly held in Bowdoin’s Peucinian Society library, shows a penciled note under the description of the hunt of wild pigeons. It reads “no[?] rare sport” and hints that the writer may have hunted the pigeons among the Bowdoin pines, as did Nathaniel Hawthorne and his cronies in the 1820s. Stone lithograph, printed and colored by J. T. Bowen after a drawing by John James Audubon. In: John James Audubon’s The Birds of America: From Drawings Made in the United States and their Territories, [Royal octavo ed.] vol. 5 (New York and Philadelphia, 1842). Audubon’s double elephant folio of The Birds of America secured his fame, but not continuing income. Thus, he planned a more affordable version of the book in smaller scale (octavo) and with less elaborate scenery that would reach a wider audience than had the magnificent original. 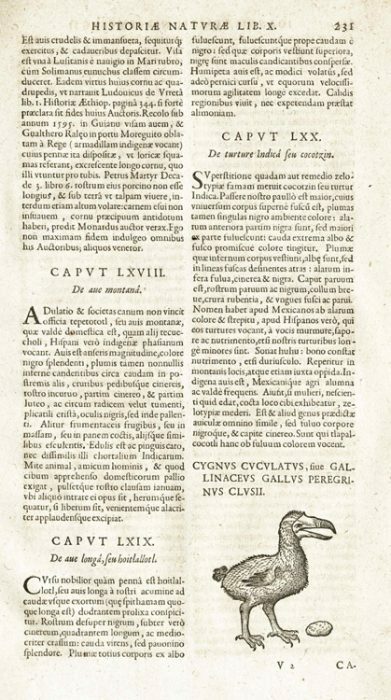 Rather than separating text and image, the seven-volume octavo edition combines them, with the illustrations printed through lithography rather than etching, and it sets the birds in a more systematic scientific order according to family. Hogarth, William. Analysis of Beauty, Plate 1. Etched and engraved print backed by fabric. 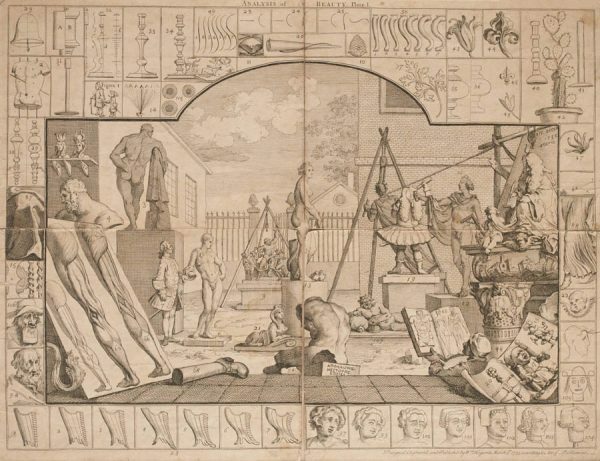 In: William Hogarth’s The Analysis of Beauty: Written with a View of Fixing the Fluctuating Ideas of Taste (London, 1753). 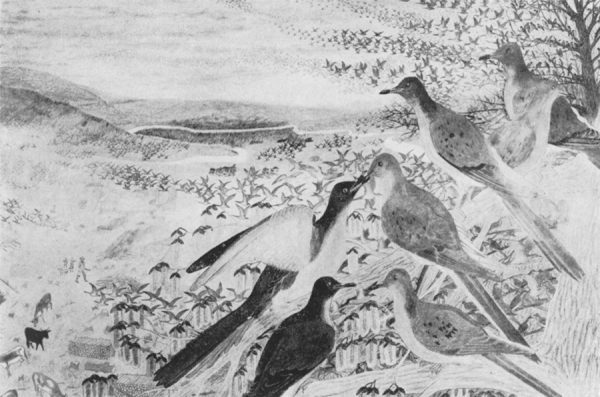 It is possible that artistic theory encouraged Audubon towards some of his more elegantly curving compositions, such as that of his passenger pigeons. In 1753 the British painter William Hogarth (1697-1764) laid out his theory of the “Line of Beauty,” an S-shaped curving line found in the most beautiful forms in nature, such as flowers: see number 4 in box 49 at the top of the print. According to Hogarth, the serpentine line captured the attention of the viewer and gave the impression of life and movement to a still image. A gently curving and undulant line imparted grace and power to works of art when used to describe the outline of a figure or interior details. Writer Franklin Burroughs convincingly detects the “Line of Beauty” in Audubon’s pigeons that animates the boundary of their bodies as well as the arching branches that support them. Wood engraving made in 1829 after a study from life, by Jonathan Fisher. In: Jonathan Fisher’s Scripture Animals: A Natural History of the Living Creatures Named in the Bible: Written Especially for Youth (Portland, Me., 1834). From the fables of Aesop to those of La Fontaine (which Audubon read and carried with him), animals figure in moral instruction in entertaining ways. Bowdoin College parent the Reverend Jonathan Fisher, of Blue Hill, Maine, offered spiritual instruction to young readers using creatures mentioned in the Bible to communicate lessons of God’s will. In 1834, he published Scripture Animals, which includes his own wood engravings as illustrations. 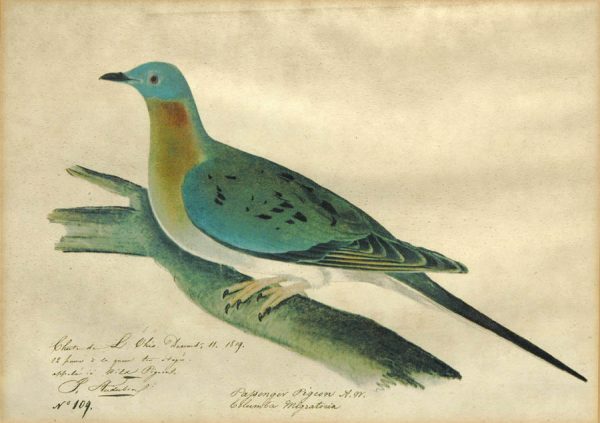 Fisher based his engraving of the male passenger pigeon on a drawing he had made from life. 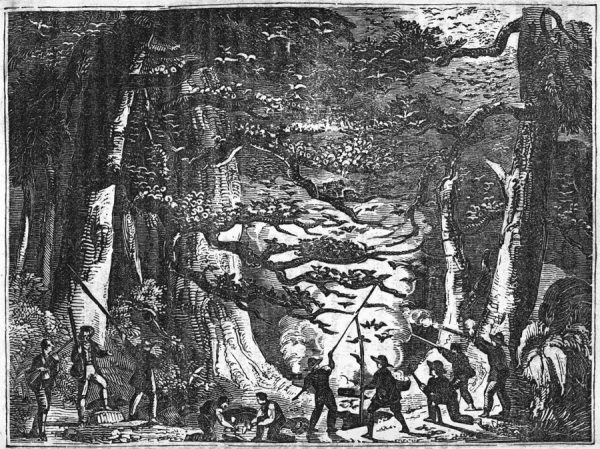 Fisher and his sons, including Josiah (Bowdoin 1828), hunted the pigeons in the 1820s when those birds still migrated through Maine in late August and early September. In the text accompanying this print, Fisher celebrates the wild pigeons as models of conjugal fidelity, mated for life. In: Thomas Campbell Eyton’s A History of the Rare British Birds, (London, 1836). British collectors and ornithologists took great interest in the North American passenger pigeon. Many specimens were brought to England from the 1820s onward, including the live birds that Audubon carried with him in 1830 and 1834. Lord Stanley, 13th Earl of Derby, successfully raised dozens of the species in his menagerie at Knowsley Hall, near Liverpool. The fate of this flock after his death remains unknown. This woodcut, although probably modeled from a dead bird, displays the tense and wary posture also captured in some of the rare photographs made of captive pigeons from Charles Otis Whitman’s flock in Chicago in the 1890s (described elsewhere in this exhibition). The Wild Pigeon of America. Woodcut, after a drawing by John James Audubon. In: Parley’s Magazine, I (1833), p. 94. 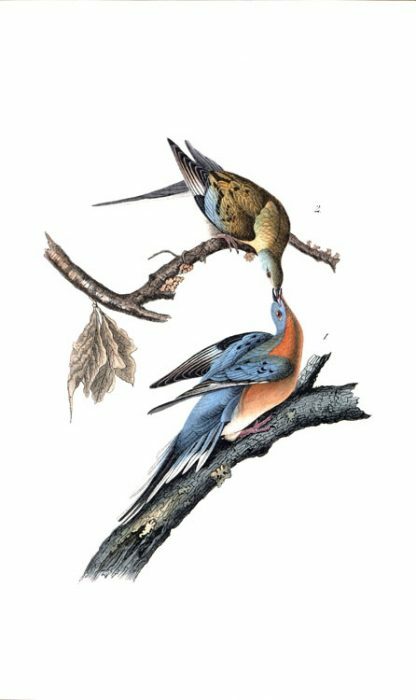 This early nineteenth-century article from Parley’s Magazine typifies the wealth of popular, informational accounts of the remarkable passenger pigeon that followed the publication of Alexander Wilson’s text in 1812. Citing Wilson, such articles universally stressed the phenomenal numbers of the birds, whose flocks could span 240 miles and comprise over two billion individuals. The writers marveled at the birds’ swiftness—60 miles per hour—as well as the flocks’ voracious appetites and the deafening tumult where the multitudes roosted, nested, and were beset by hunters. In contrast, the accompanying image shows an early imitation of Audubon’s mild pair of peacefully billing birds, first published in 1829. Tiny, crude, and reversed, the print testifies to the potency of Audubon’s image, which had quickly supplanted Wilson’s as the definitive vision of the passenger pigeon within the popular imagination. Flight of the Passenger-Pigeon in an American Wood. Woodcut. 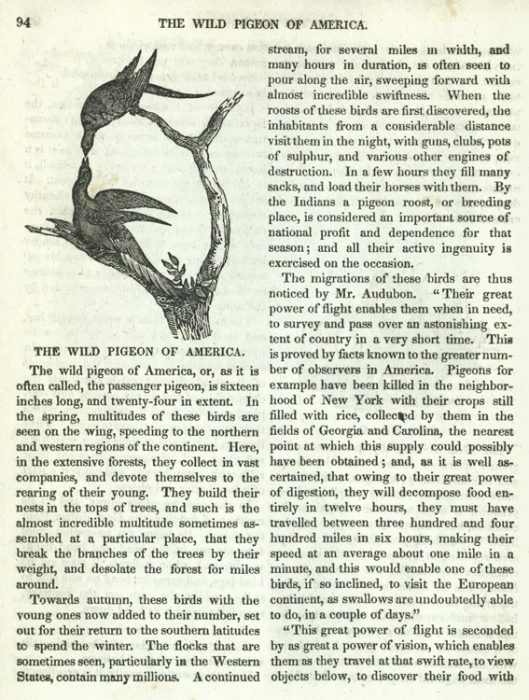 In: “Passenger or Wild Pigeons of America,” Parley’s Magazine (January 1, 1844), pp. 52-54. This rough woodcut with its darkened background appears to show the depredations made by hunters among roosts and nestings of the wild pigeons. Three hunters wield long staffs to knock the birds out of the massive ancient trees. Five hunters with guns flank them, taking aim at the frightened flocks trying to escape. The dead and dying flutter to the ground, where two assistants gather the slain birds. The billowing smoke that illuminates the middle ground recalls the pots of burning sulphur used to suffocate nesting birds that were out of reach of sticks or too shielded by branches to make clear targets for gunners. In: Samuel G. Goodrich’s Recollections of a Lifetime, or, Men and Things I Have Seen, vol. 1 (New York, 1859). Samuel G. Goodrich recalls his boyhood around 1805, when vast flocks of wild pigeons streamed through the skies of Fairfield, Connecticut. He recounts the thrill of netting dozens of birds on West Mountain using live decoys whose fluttering, as if feeding, attracted the wild flock to the trap. The “rushing sound of the pigeons pouring like a tide over the tops of the trees” struck him with awe. 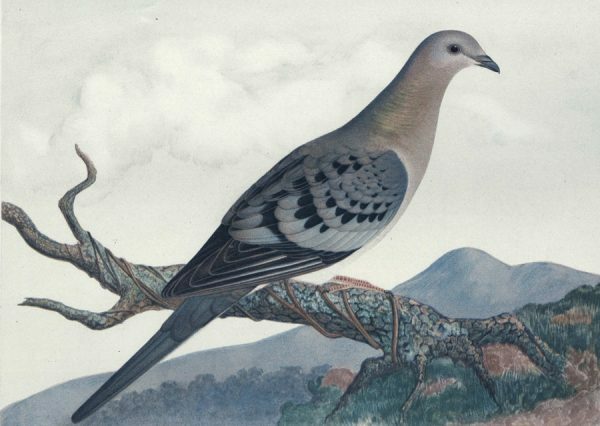 The print features a handsome male pigeon, copied after Alexander Wilson’s drawing, while a pair in the middle ground mimics Audubon’s. In the right background stands the hunters’ blind—the “bough house”—from which ropes stretch ready to spring the nets over the feeding birds. Other birds perch on the bough house itself and on the bare branches of a tree. 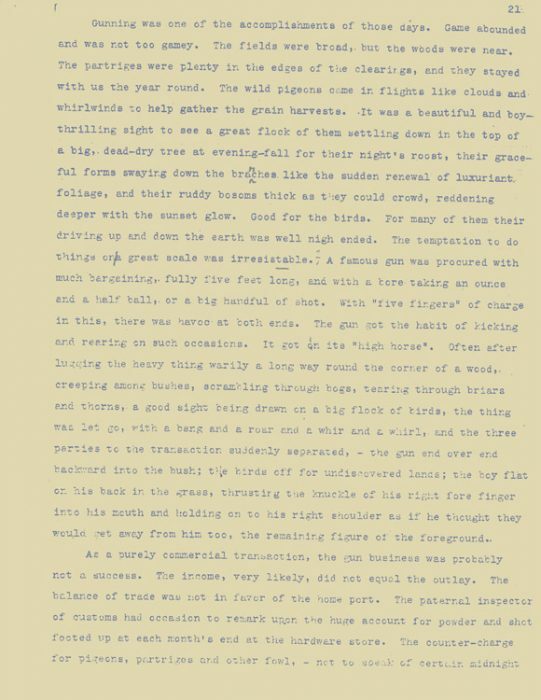 Typescript with holograph corrections (copy) [before 1905], Joshua Lawrence Chamberlain Collection. Subsequently published as: “Blessed Boyhood!” The “Early Memoir” of Joshua Lawrence Chamberlain (Brunswick, Maine, 2013). Gunning was one of the accomplishments of those days. Game abounded and was not too gamey. The fields were broad, but the woods were near. The partridges were plenty in the edges of the clearings, and they stayed with us the year ‘round. The wild pigeons came in flights like clouds and whirlwinds to help gather the grain harvests. It was a beautiful and boy-thrilling sight to see a great flock of them settling down in the top of a big, dead-dry tree at evening-fall for their night's roost, their graceful forms swaying down the branches like the sudden renewal of luxuriant foliage, and their ruddy bosoms thick as they could crowd, reddening deeper with the sunset glow. Good for the birds. For many of them their driving up and down the earth was well nigh ended…. Passenger pigeon. Chromolithograph, from a design by Theodore Jasper. 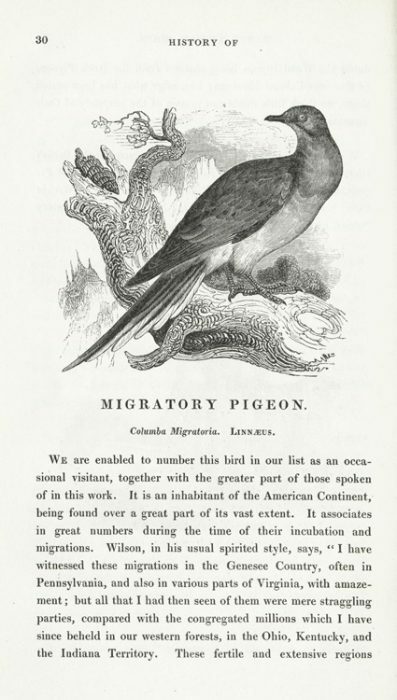 In: Jacob Henry Studer’s Studer’s Popular Ornithology (Columbus, Ohio, 1878). Called by one reviewer “a ponderous and unimportant book” with figures of indifferent quality, it posed no threat to Audubon’s work. 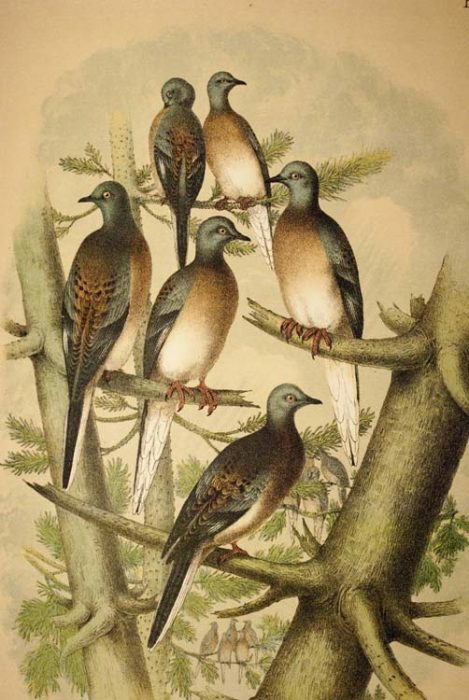 Still, Jasper’s image of the passenger pigeons does show the gregarious birds clustered on broken limbs, recalling the destruction that the tremendous weight of the flocks could wreak on even large trees. The bird shown at the top preens while the rest show off back view, side view, and three-quarter view from right and left. The Game Stall, Fulton Market, New York City. Woodcut, after a drawing by Theodore R. Davis. 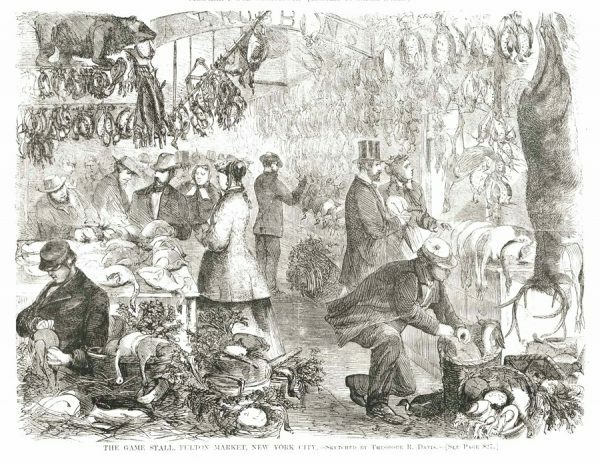 In: Harper’s Weekly (December 26, 1868), p. 829.The public’s appetite for the inexpensive flesh of passenger pigeons and their fatty squabs helped to make the wild game dealer A. Robbins of New York City a millionaire. Hundreds of barrels, which could hold 400 passenger pigeons each, poured into game market stalls in Chicago, Boston, St. Louis, and New York, quickly transported by the railroads that by mid-century connected hunting sites of mass slaughter in Michigan, Wisconsin, and Pennsylvania to the urban centers. The wild pigeons were both food for the poor and the basis of the finest delicacies served in elite restaurants. Stewed pigeon with peas or mushrooms, pigeon patties with truffles, boned pigeon stuffed with foie gras fed the rich at the New York City Hotel or Delmonico’s. More humble diners made do with pigeon pie.Pigeon prices ranged with season and location. Back in 1830, in Brunswick, Maine, passenger pigeons sold for 15¢ per dozen. 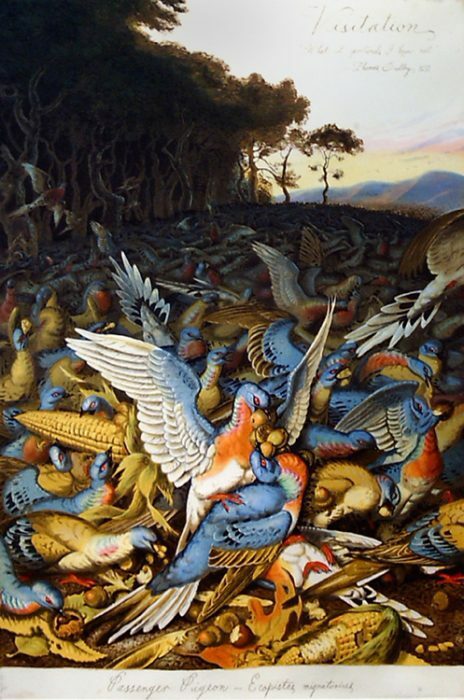 When the massive killings resulted in glutted markets, the birds could not be given away. Ernest Ingersoll’s “Four American Game Birds." Drawing by J. Carter Beard. In: Harper’s Weekly (October 12, 1889), p. 809. 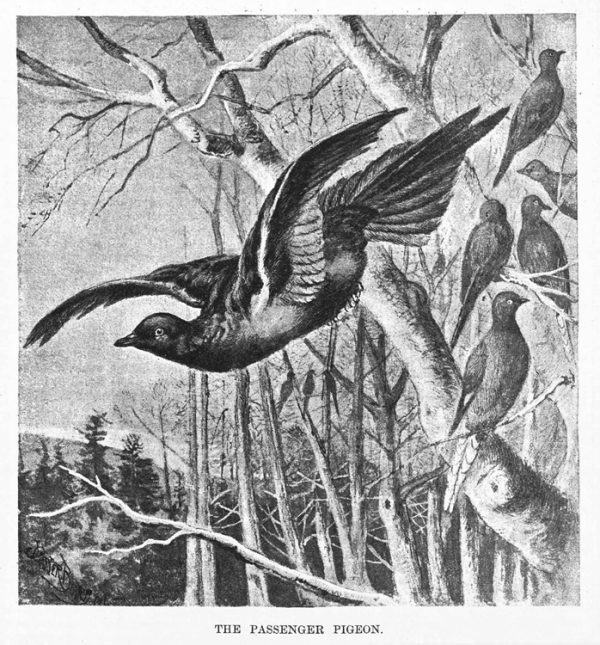 J. Carter Beard depicts one pigeon in flight with a rather slumping posture, while its fellows roost placidly on dead limbs. The author of the article, naturalist Ernest Ingersoll, was an early supporter of the protection of wildlife and its natural habitats. He laments that clearing away mast-bearing trees such as oaks and beeches, which fed the wild pigeons, and the “incessant destruction of old and young which falls upon every accessible roost as soon as it is reported” have greatly diminished the species. He writes that in 1889, “the birds’ splendid flight still cheers us now and then in autumn and spring, as in long bending lines these noble birds rush across the sky … but the glory of the tribe has departed with the disappearance of savagery in the land, and the passenger pigeon—the very image and spirit of exultant wildness—will soon be a rarity.” Just twenty-five years later, the passenger pigeon would be extinct. 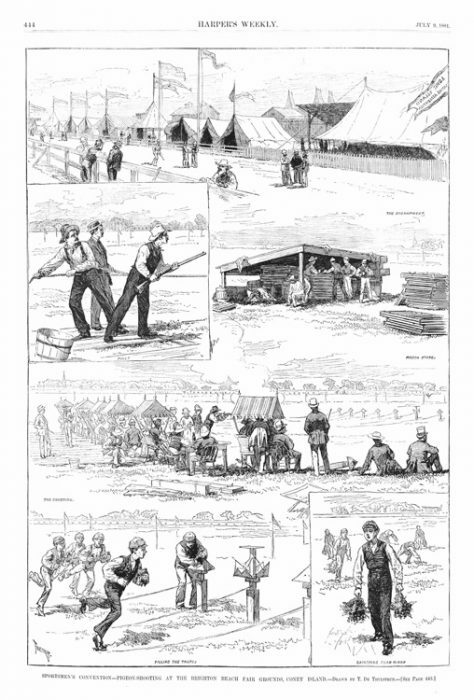 Sportsmen's Convention—Pigeon-Shooting at the Brighton Beach Fair Grounds, Coney Island. Woodcut, after a drawing by T. De Thulstrup. In: Harper’s Weekly (July 9, 1881), p. 443. “This is the biggest shooting match ever seen on the face of the earth … and there never were better birds. Just see how they fly. Don't that fellow tower well?” he said, pointing to a pigeon which mounted straight up into the air. “There goes a tailer!” he exclaimed, as one flew straight away from the marksmen. “That's a driver” pointing to one that went skimming to the ground in rapid flight for safety; “they're hard to hit…. Ah, that fellow quartered well!” he said, as a pigeon went off to one side. “A quarterer makes the best shot,” he added. Silent Wings: A Memorial to the Passenger Pigeon(Madison, Wisconsin: Wisconsin Society for Ornithology, 1947). We meet here to commemorate the death of a species. This monument symbolizes our sorrow. We grieve because no living man will see again the onrushing phalanx of vigorous birds, sweeping a path for spring across the March skies, chasing the defeated winter from all the woods and prairies of Wisconsin. Men still live, who, in their youth remember pigeons; trees still live that, in their youth, were shaken by a living wind. But a few decades hence only the oldest oaks will remember, and at long last only the hills will know…. For one species to mourn the death of another is a new thing under the sun…. Because our sorrow is genuine, we are tempted to believe that we had no part in the demise of the pigeon. The truth is that our grandfathers, who did the actual killing were our agents … in the sense that they shared the conviction, which we have only now begun to doubt, that it is more important to multiply people and comforts than to cherish the beauty of the land in which they live…. 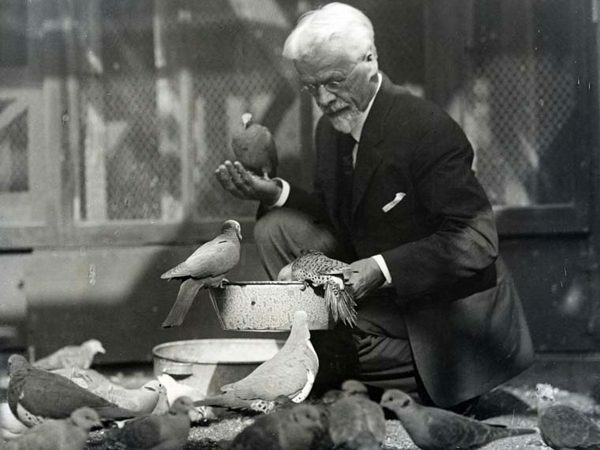 University of Chicago Professor of Zoology Charles Otis Whitman feeding his pigeons. Professor Whitman kneels amid his pigeon flock, holding one bird on his cupped right hand while an avid flicker dips into the feeding bowl. This intimate portrait demonstrates the scientist's deep affection for these subjects of his studies on heredity. None of the birds pictured is a passenger pigeon. 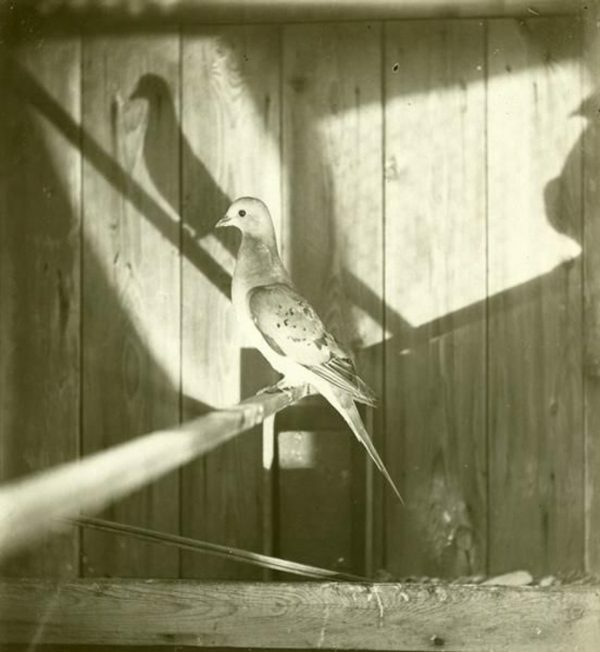 The photograph may have been taken at Whitman's Chicago aviary after he had given up his small flock of passenger pigeons in 1907. Courtesy Special Collections Research Center, U. of Chicago Library. J. G. Hubbard photographed Whitman's recently acquired flock of passenger pigeons at Woods Hole, Massachusetts, in late August and early September of 1896. The two dozen images Hubbard produced, showing a nest, an egg, a young squab, as well as adults, represent the bulk of known photographs of captive (or recently shot) birds. Most of the others are photographs of Martha in the Cincinnati Zoo. The Wisconsin Historical Society holds copies of Hubbard's photographs. Adult female passenger pigeon, Ectopistes migratorius. Print, after a painting by T. Hayashi. In: Posthumous Works of Charles Otis Whitman, vol. 2 (Washington, D.C., 1919). Charles Otis Whitman, (Bowdoin B.A. 1868; Sc.D. 1894), a pre-eminent biologist and embryologist, founded the zoology departments at Clark University (Worcester, Massachusetts) and the University of Chicago; he was also the founding director of the Woods Hole Marine Biological Laboratory. Whitman undertook his genetic studies observing a flock of many species of wild and domestic doves and pigeons. His flock of wild passenger pigeons was one of the last surviving groups — “Martha,” the last known passenger pigeon, very probably came from Whitman’s flock. She died in the Cincinnati Zoo on September 1, 1914. K. Hayashi, one of two Japanese artists Whitman employed as illustrators, painted this mature female from life sometime between 1896 and 1907. Passenger pigeon (Ectopistes migratorius), male. 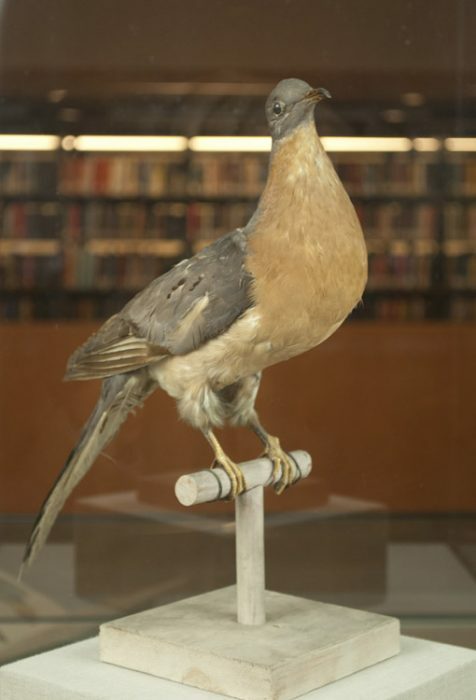 This fine specimen of a male passenger pigeon carries no record of when or where it was collected. Bowdoin students known to have prepared mounted specimens during their college years included Charles Otis Whitman (1868), who kept his room full of mounted birds, and Robert E. Peary (1877), whose taxidermy work helped to pay his school tuition. Perhaps one of them or Professor Alfred Otto Gross, who taught biology from 1912 to 1953 and brought a collection of ornithological specimens to the College, provided the bird. This specimen retains just a hint of iridescence in the feathers on the side of its neck, a feature that made the streaming flocks flash like rainbows as they swiftly changed direction in flight. It also displays the long throat and extended tail feathers that gave the species its distinctive elegant silhouette. Frontispiece reproduction of a painting by Louis Agassiz Fuertes. In: W. B. Mershon’s The Passenger Pigeon (New York, 1907). Louis Agassiz Fuertes (1874-1927), named after the great Harvard zoologist and geologist Louis Agassiz, began his study of birds and painting as a young boy. Celebrated as a “modern Audubon,” he made thousands of bird paintings for ornithological studies as well as for private patrons. 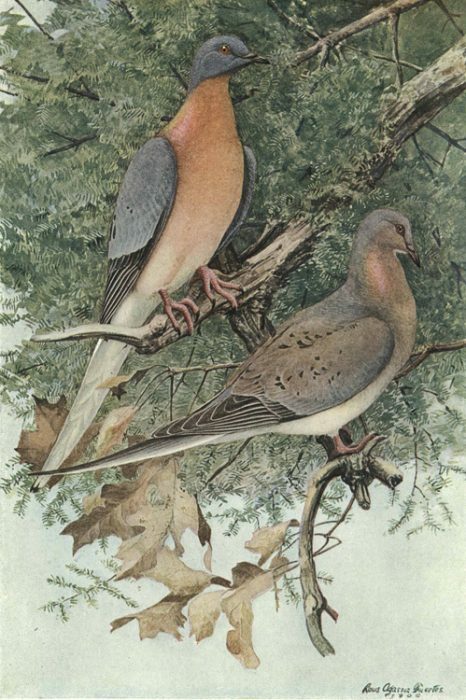 His paintings, like this image of a male and female passenger pigeon, were praised for lifelike poses and precise detail. Most likely studied from preserved specimens, Fuertes’ pigeon pair captures well the vivid coloring of the birds that were popularly called “blue meteors” for their swift flight. Passenger Pigeon — Eastern Mourning Dove. Reproduction of a painting by Louis Agassiz Fuertes. In: Portraits of New England Birds, Drawn in Color by Louis Agassiz Fuertes and Allen Brooks, for “Birds of Massachusetts and Other New England States” by Edward Howe Forbush (Boston, 1932). 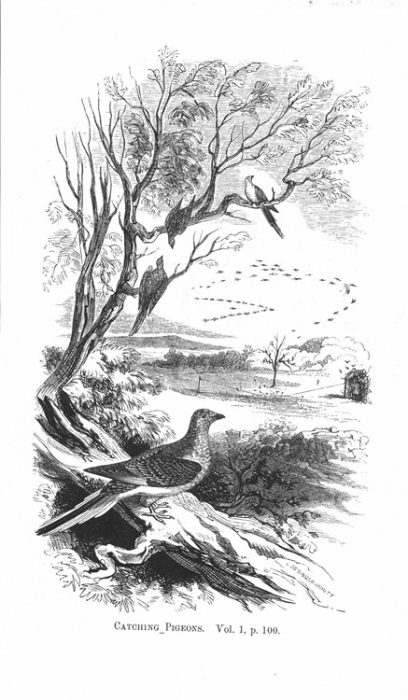 Fuertes’ plate for the 1932 edition of Portraits of New England Birds shows male, female, and juvenile passenger pigeons even though the species had been extinct for eighteen years. Unverified claims of sightings of the pigeons continued for decades, as did fanciful theories that suggested the birds had migrated to South America and changed the color of their plumage there. 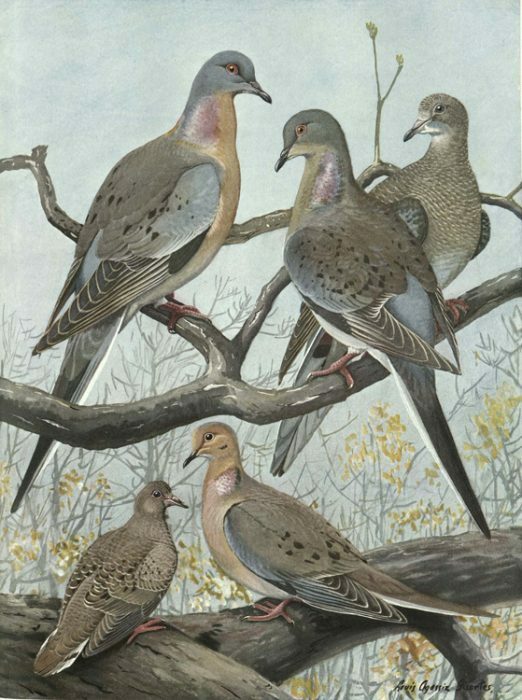 Many of the birds collected and thought to be passenger pigeons after 1914 were determined on inspection to be mourning doves that had been mistaken for the larger and lost species. Color etching, aquatint, spit-bite and drypoint on paper, 2004; 44 x 31 in. Walton Ford’s natural history print dramatizes the tornado of life described by Aldo Leopold. As Ford imagines it, the huge flock of voracious birds swarms with life and death. The one male bird crams a giant acorn into the maw of another, while fellow birds lie crushed beneath the mass. A sea of blue bodies stretches to the horizon. Ford’s print offers an ironic twist on Audubon’s loving pair. It also carries the tone of criticism for the all-devouring hordes that could strip almost all edible mast from the forest floor. The image offers up a mirror of human behavior, showing a group caught up in the frenzy of incessant and excessive consumption, heedless of the consequences. Frontispiece reproduction of a painting by Louis Agassiz Fuertes: Male and Female Heath Hen. In: Alfred O. Gross’s The Heath Hen (Boston, 1928). 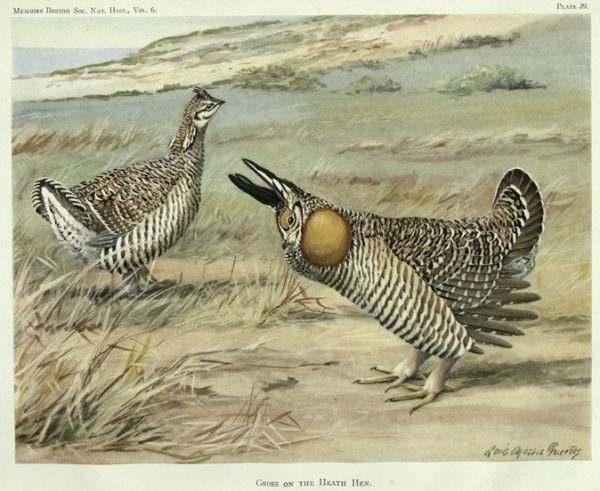 The heath hen, a bird related to the prairie chicken, lived along the eastern coast of the United States. Extremely common at the time when the first Europeans arrived, the bird dwindled in numbers under extreme pressure from hunting. As early as 1792, the state of New York passed a bill for the preservation of the heath hen, one of the first legislative efforts to save a species from extinction. The last remaining populations became the special study of Bowdoin College ornithologist Alfred Otto Gross. Despite efforts to protect the bird and its habitat, the last of the species probably died in the 1930s. Fuertes’ posthumously published colored print features the male heath hen in its full glory, strutting on its dancing ground—a lek—as it inflates its yellow throat sacks to attract the watching hen. Pen and ink cartoon by Francis Dahl, [193-? ], Alfred Otto Gross Papers. Like the extinction of the passenger pigeon, the extinction of the heath hen was initially doubted in the public press. 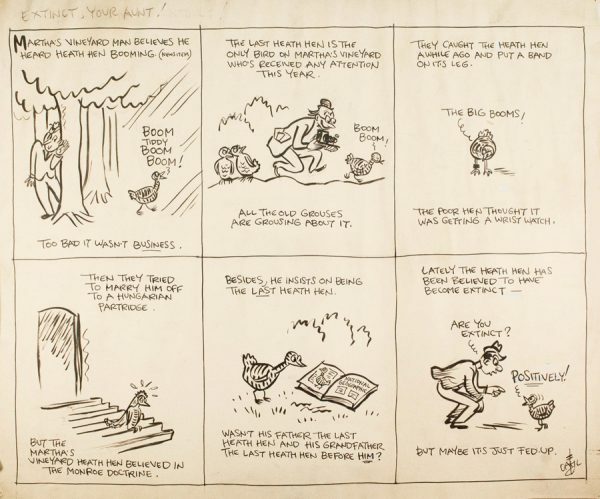 The popular Boston cartoonist Francis Dahl, who worked for the Boston Herald starting in 1930, presumably sent this unpublished drawing to Prof. Gross in the 1930s. It displays a disgruntled heath hen, loudly pooh-poohing the notice of its extinction. “Extinct, My Aunt,” a phrase now out of fashion but comparable to “…, my foot,” was used to express disbelief. No record remains of Prof. Gross’s reaction to the cartoon, although he obviously fancied it enough to retain it among his papers.